Have you ever presented a recycling plan to the superiors at your office, only to be met with blank stares? Told bewildered colleagues that the florescent office lighting they replaced with extra hot and dim halogen track lighting is burning five times more carbon? Explained yet again that plastic bottled water is a ridiculous waste of resources, from cradle to grave? Wondered if there was a resource for people who somehow missed the entirety of the factual information they were exposed to in An Inconvenient Truth? It's a pain. In this day and age there are still folks who don't know that recycling makes a difference, certain light fixtures burn loads of power, bottled water is wasteful, and that without a reduction in carbon emissions (forget reduction in rate of emissions, which is all politicians talk about) we are going to burn ourselves out of a home. 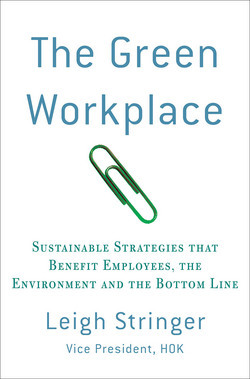 One way to get people's attention, or to clear away their stubborn ignorance, is to direct them to The Green Workplace , a book by architect and MBA Leigh Stringer (who was also a classmate of mine in architecture school). The book is aimed at CEOs and CSOs and other C-Suite folks who may be titans in the business arena, but are painfully dumb when it comes to the tidal wave of sustainability issues that are going to affect their bottom line in the next few years. The book makes a convincing case for how sustainability can benefit the bottom line, making the case so plain that even business owners who won't spend a dime to sustain their community or environment will be forced to acknowledge that there's money to be made by going green. The least interesting thing about this book it that it sometimes feels like it's overcompensating for the C-Suite folks. 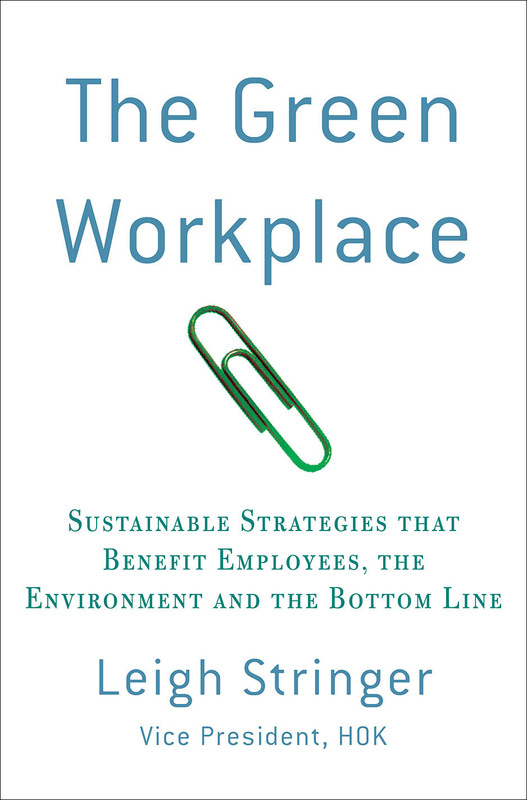 Does anyone who is playing at the upper levels of business really not know about how major corporations save oodles of money by saving energy, reducing waste, and making employees more productive? The answer to this question is, unbelievably, yes, and the author is well aware of it. The flip side of this is that Ms. Stringer patiently goes over these points in great detail, and undoubtedly there are some details that those who are very trained in sustainability issues (like me!) have missed. The book also plays double duty. It is both a how-to book for the enthusiastic in-house environmental organizer and also an eye-opener to the internet deprived business traveler who found the book on a layover in Tuscon. Like the blog from which it sprang, the book is good for grazing on the parts you are interested, and discovering new concepts and ideas that you will read about later. For me this new territory was the introduction of a few green business measuring systems I didn't' know about (Triple Bottom Line or Balanced Scorecard), none of which are new concepts. You'll find your own new territory, and undoubtedly create a new reading list as a result. The refreshing part of Mrs. Stringer's approach is that the focus is doggedly on organizational behavior. It assumes that everyone agrees that our behavior effects planetary environmental shifts, and that no convincing on that front is necessary. It gets to work. It also feels like a work in progress, like one in a series of books, or blogs. When I chatted with Leigh about the book, she acknowledged that the metrics of environmental business are not equal to the task at hand, and will probably need updating. What ever Book 2 looks like, we admire that this one covers all the bases, for now, and is plugged into a more active blog that will continue the conversation. When you choose to tune in, Leigh Stringer will be ready for you, and she will get you up to speed in no time.